I love granola but it can get expensive really quickly if you solely purchase it in a store. I searched for a recipe and my favorite was this one from Bon Appetit, but of course I had to alter it. 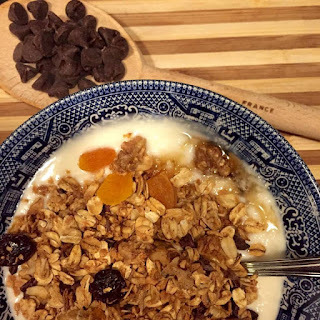 I couldn't imagine a granola recipe without real maple syrup (spoken like a true Vermonter), and I substituted walnuts for the pecans and melted butter for the vegetable oil. Oh, and I added cacao nibs, although that doesn't mean you can't also add chocolate chips later. Enjoy! Preheat oven to 300°F. Line a cookie sheet with parchment paper. In a separate bowl, combine all ingredients except for the dried fruit and cacao nibs. I added the hot, melted butter last and stirred everything together. Spread mixture on cookie sheet and bake for approximately 30-40 minutes, stirring every 10 minutes. Granola will be golden brown when ready. Let cool, and then stir in fruit and cacao nibs. My favorite way to enjoy the granola is over Greek vanilla yogurt, shown here as a dessert with an additional swirl of maple syrup and chocolate chips. Add fresh berries for a healthy boost. Click here to read more about the blog's founder. Are you interested in submitting an article or a product for review? If so, please do get in touch. First Time Buying a House? 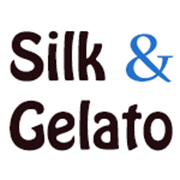 Welcome to Silk & Gelato!